Change of Ownership – This method will change any attached business linked to one account and move them to another account. By using this option the landlord relation will change to the new landlord automatically together with any outstanding charges, balances and invoices. Changing the business(s) attached to an account – This method allows you to alter the way business(s) appear on an owner’s statement, ie. either moving multiple businesses from one account to individual accounts or moving a single business to one account with businesses already attached. Each business will be listed separately on the one statement. Go to the Work Centre menu, select the Accounts tab. Click , located at the bottom of the screen. Find and select the account that you want to take the money from. If All is selected, it means that all the business associated with that account will transfer to the new account. 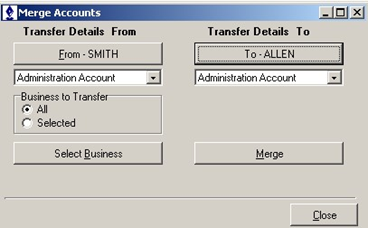 If Selected is selected, it means that you can select which business to transfer to the new account. Find and select the account where the money is being transferred to. A warning displays asking if you want to Merge these accounts? Click Yes. 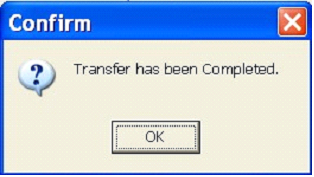 A confirmation pop-up displays, confirming Transfer has been Completed. You will need to ascertain which account will stay and which accounts will be merged. Using the Account ID is the easiest way to do this. Go to the business and beneath the Status button, you will see the Account ID. Write down theAccount ID. Do this for each business that you want on the same account. Work out which Account ID you want to keep. Go to the Work Centre menu, and click the Accounts tab. Find and select the Account ID that you want to take the money from. Find and select the account where the business(s) is being transferred to. A warning displays asking if you want to Merge this accounts? Click Yes.